In support of this year’s National Day of Service and Remembrance, Disney On Ice is inviting Chicago-area fans to help feed their hungry neighbors with donations to the city’s Marillac Food Pantry. Disney On Ice stars will be accepting non-perishable food donations from 10:30 to 11:30 a.m. on Wednesday, Sep. 11, at the Marillac Social Center, 212 S. Francisco Ave., Chicago. For each of the first 100 standard-size grocery bags of food received, up to a total of six bags per donor, Feld Entertainment will provide a free ticket to Disney On Ice celebrates 100 Years of Magic, appearing Sep. 11-15 at Chicago’s United Center. Easy, pull-up donation drop-off will be available on the south side of Adams, just west of Francisco. Among the highest-demand food pantries in Chicago, the Food Pantry at Marillac serves the city’s West Side “food desert” where, according to a Greater Chicago Food Depository study, more than 50,000 residents are food insecure. The poverty rate in the communities served by Marillac averages over 30 percent, and in East Garfield and North Lawndale, it’s closer to 45 percent. The Food Pantry at Marillac currently serves an average of more than 1,000 families every month, and demand continues to grow. For additional information, visit www.marillachouse.org. Disney On Ice calls Chicago’s West Side home, twice each year, with a combined three weeks of performances at the United Center, and its producer, Feld Entertainment, maintains a year-round office in the city. For more information or to buy tickets to the Sep. 11-15 United Center performances of Disney On Ice celebrates 100 Years of Magic, log on to www.disneyonice.com or call (800) 745-3000. You can also visit Disney On Ice on Facebook or YouTube. ChiIL Mama will be there opening night... will YOU?! We'll have our usual photo filled recap up shortly. We've been part of the FELD blogger community for years now and it's our pleasure to once again be partnering with them for the 2013-14 season. 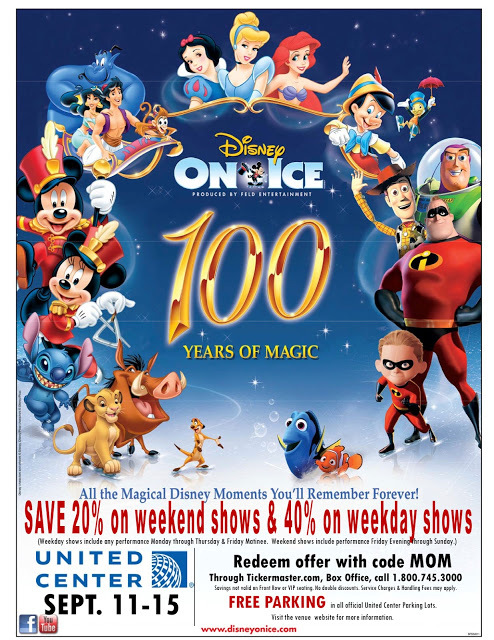 Click here for our past coverage on DISNEY ON ICE CELEBRATES 100 YEARS OF MAGIC including a code for discount tickets. Mickey Mouse, Minnie Mouse and their friends from Disney’s Mulan, The Lion King and Pinocchio, and Disney/Pixar’s Finding Nemo, The Incredibles and Toy Story, will take to the ice for a grand celebration in Disney On Ice celebrates 100 Years of Magic, Sep. 11-15, at the United Center. Produced by Feld Entertainment, this fanfare production features more than 60 unforgettable Disney stars that span the decades, a sing-along score of award-winning Disney music, stunning choreography, elaborate sets and beautiful costumes. Tickets, starting at $13, are available at the United Center Box Office, 1901 W. Madison St., Chicago, all Ticketmaster locations, on the web at www.ticketmaster.com, and by phone at (800) 745-3000. Ticket prices are $13, $20 and $25, with a limited number of $40 (weeknight) and $50 (weekend) VIP, and $55 (weeknight) and $70 (weekend) Front Row seats available. Parking is FREE in all official United Center parking lots. Service charges, facility and handling fees may apply.